Stage one: Clean the track side of the PCB with wire wool or a PCB eraser. Stage two: Position the components, checking they are in the right position and the correct way round. Stage three: Clean the tip of the ‘hot’ soldering iron, by wiping it on a damp foam pad. Stage four: Heat both the component and the copper track and then apply the solder. 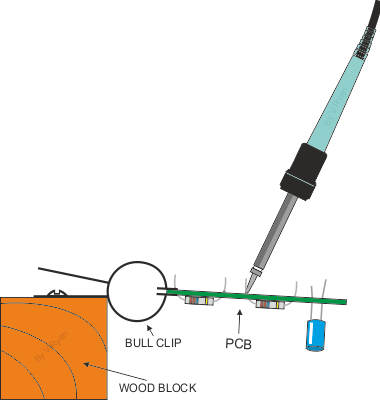 Electronic components are metallurgically joined to the copper tracks of a PCB, using solder. Solder is an alloy of tin and lead (63% tin and 37% lead). Lead is toxic. 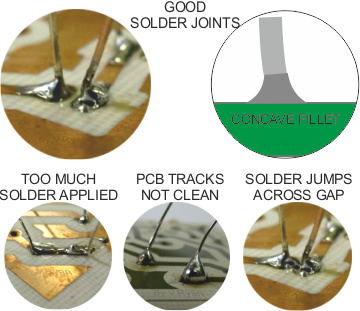 Consequently, lead free solder is popular. The lead has been removed and replaced with other metals. However, these solders work at higher temperatures. Good soldering produces a ‘concave’ solder joint. 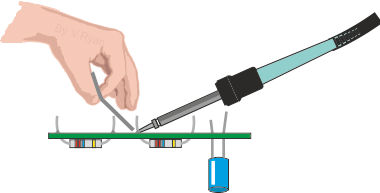 The soldering iron must be at the right temperature, applied to the track and ‘wire’ for the right amount of time, with a ‘small’ amount of solder applied.